Thanks for another well written guestblog, Mårtenbrother! Incredible that it's been 30 years since we picked up the second volume. I remember listening to it a lot, it really was a great introduction to some of Elvis' later studio material. I didn't fully understand the "Pure Elvis Sound" concept back then, I just enjoyed the music. Now at least I know what Joan Deary aimed to do, but like you say, it would have been nice to get some information on how these "pure" versions were accomplished. My guess is that it is the dubbed masters she has tampered with, but who knows? I also found it interesting that Joan Deary picked a couple of earlier songs for the third, cancelled, volume, like "When I'm Over You" and "Heart Of Rome". Not exactly the strongest numbers, in my opinion. It would have made more sense to include some of the cuts that didn't make it to the final album, like "For Ol' Time Sake" (what a beautiful version!) and "Pledging My Love". Also, in Joe Tunzi's book Elvis Sessions III there is a photo of this lost album, both of the front and back, I wonder why it wasn't included in the booklet. And finally, surely the unreleased Our Memories Of Elvis Volume 3 would be the perfect candidate for a "what if" vinyl LP from FTD? 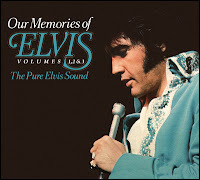 Hi JohanD, your comment made me curious, so I listened closely to "When I'm Over You" on FTD's new Our Memories Of Elvis package, as well as on Love Letters From Elvis and Bilko's More Pure Elvis bootleg album. I agree that they sound a bit different, but I think it's only due to the fact that the mixes are different. I also noticed that there are no alternate takes of "When I'm Over You" on FTD's version of Love Letters From Elvis and that, in fact, take 1 is the master. REally excellent review on your Facebook page by David Riddell. Clearly very knowlegeable and addresses the all important sound quality comparison. Great stuff. @Thomas, i guess you are right about "When i'm over you". Keep up the good work with this blog! !